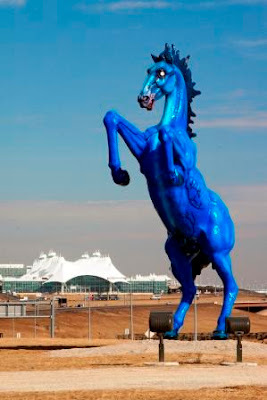 In Denver there is a 42-foot blue bear that they say comes down from the mountains and peers in through the Convention Center windows to see what's going on. However, yesterday the bear was hampered by an 8-foot ball-and-chain of yarn. The yarn bombing was short-lived. The staff at the Convention Center removed it 2-1/2 hours after it was put in place. Since all of this was done in the very early morning hours, not many got to see it, but the story was on the news over breakfast and written up in the newspaper, so we have proof of the happening. According to the newspaper, the Denver Post, "the bear's extralegal accoutrement consists of an enormous inflated rubber ball, chain links formed from a dryer-vent duct and an oversized leg cuff made from chicken wire. All of these elements are covered in a thick cozy crocheted from every skein of Red Heart Super Saver Turqua blue acrylic yarn Esther [one of the yarn bombers] could lay her hands on". 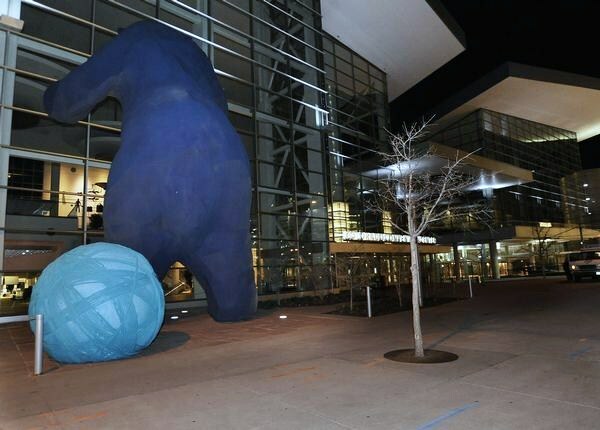 It took 21 minutes to attach the big blue ball and chain to the bear at 4:00 am. The bear holds a special interest for me. I worked with the artist's wife, Anne, a number of years ago and she would bring in her husband's (Lawrence Argent) drawings of the bear-in-progress. It was fun to get sneak peeks. Here's an article from June, 2005 that you might enjoy, click here. I like the bear and it's too bad that the ball-and-chain didn't remain for a while for all to see. Oh well. I wonder where the yarn bombers, self-named as the Ladies Fancywork Society, will strike next. I wish they would have left the ball and chain on the bear, at least for a while. I LOVE that horse and if the yarn bombers need help, I hope they call me! I didn't know about the blue bear and enjoyed both your post and the article you linked to.